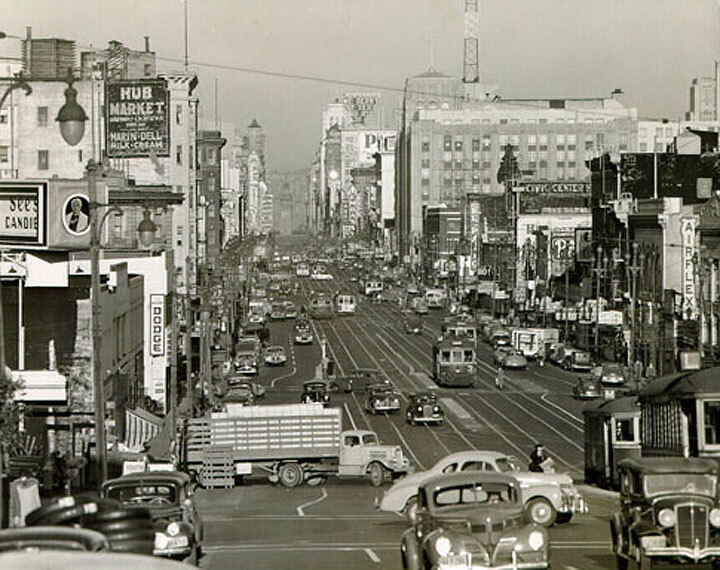 Valencia and Market, 1945, when the intersection was still the heart of a now-forgotten neighborhood called "The Hub." Market at Valencia (tracks turn left onto Valencia), Sept. 14, 1945. The Hub, looking east on Market from apx. Octavia, 1940s. 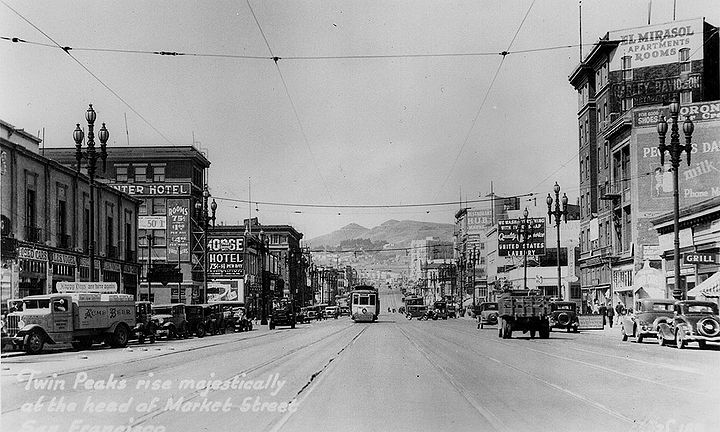 Market Street west from Van Ness, c. 1932, into the heart of the Hub neighborhood. Looking east on Buchanan towards Market, c. 1883. 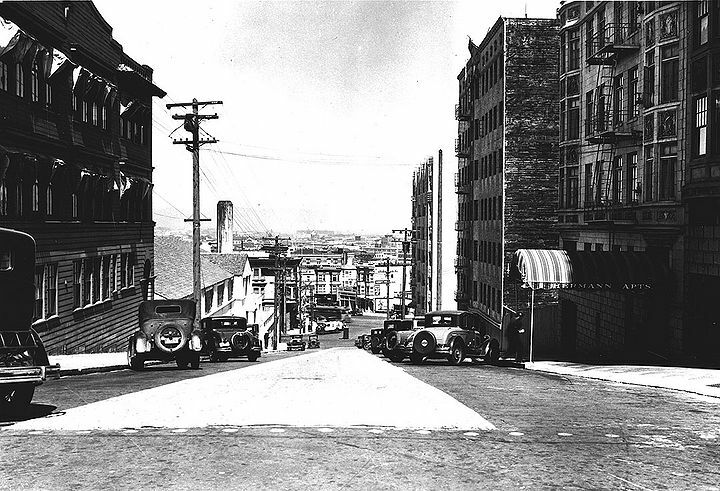 Hermann Street east from Buchanan towards Market and Laguna, 1932., San Francisco Teachers College (later San Francisco State College) at left. 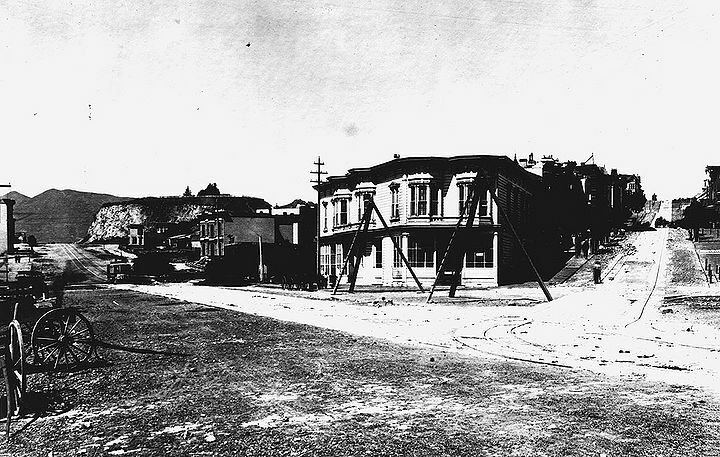 Market and Haight intersection, c. 1900. Mint Hill still prominent on north side of Market at top of hill. 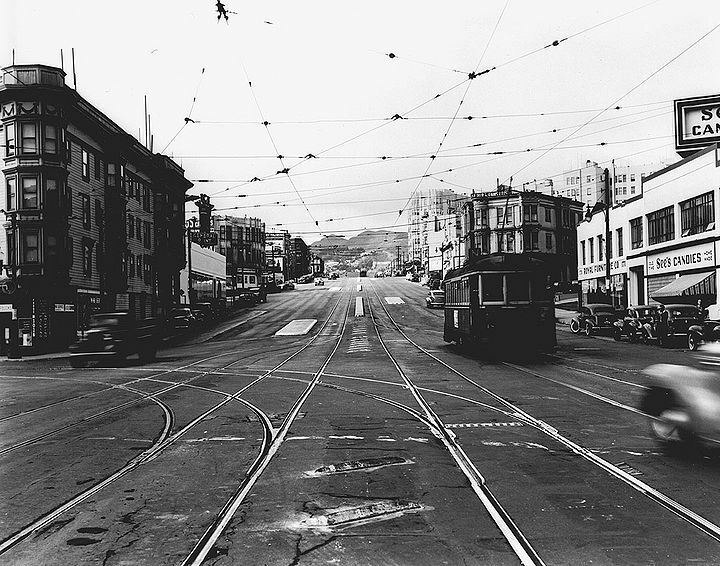 For many decades beginning in the 1880s through the 1950s, the intersection of Market, Valencia, Haight and Gough Streets was popularly known as the “Hub,” because no fewer than four streetcar lines converged there either on their way downtown or outbound to outlying neighborhoods. 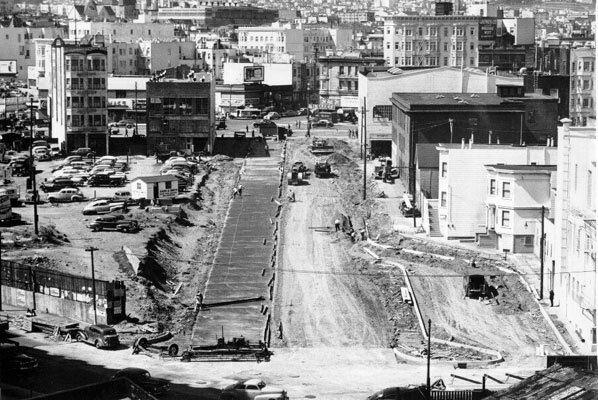 The Municipal Railway and the Market Street Railway ran on four tracks on Market Street; the 9 Valencia ran on Valencia and the 7 Haight on Haight Street. 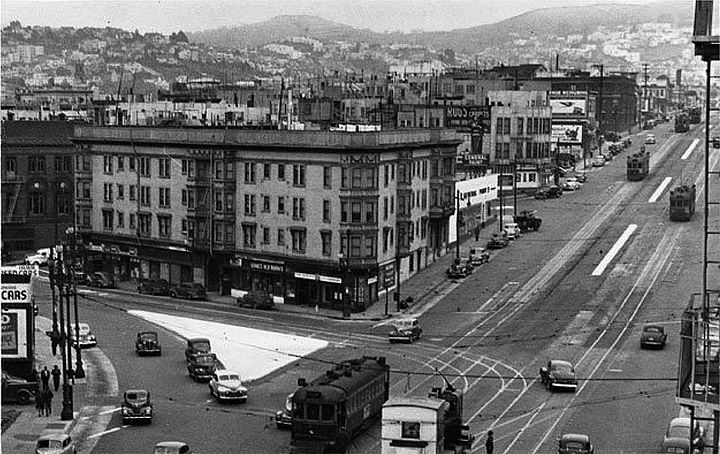 The intersection was a busy transit hub, with streetcar lines radiating out from it along Market St., Valencia and Haight Streets. Over the course of decades, the intersection and surrounding neighborhood remained a transit hub even as streets were reconfigured and streetcar lines were replaced with buses. 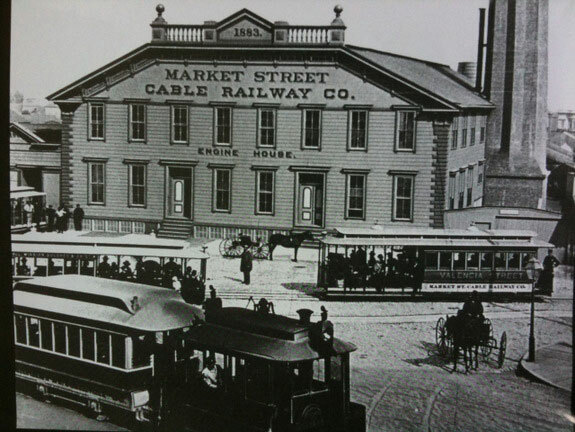 The United Railroads Powerhouse at Valencia and Market, 1880s. 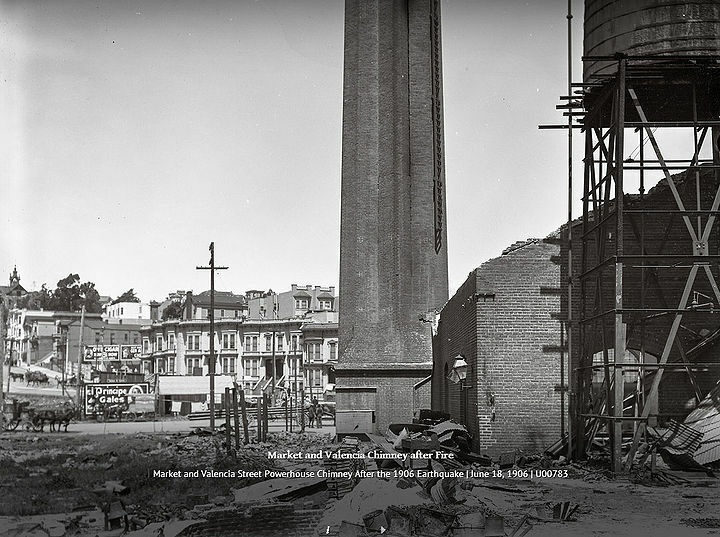 Powerhouse ruins after 1906 earthquake and fire, Haight Street in distance. 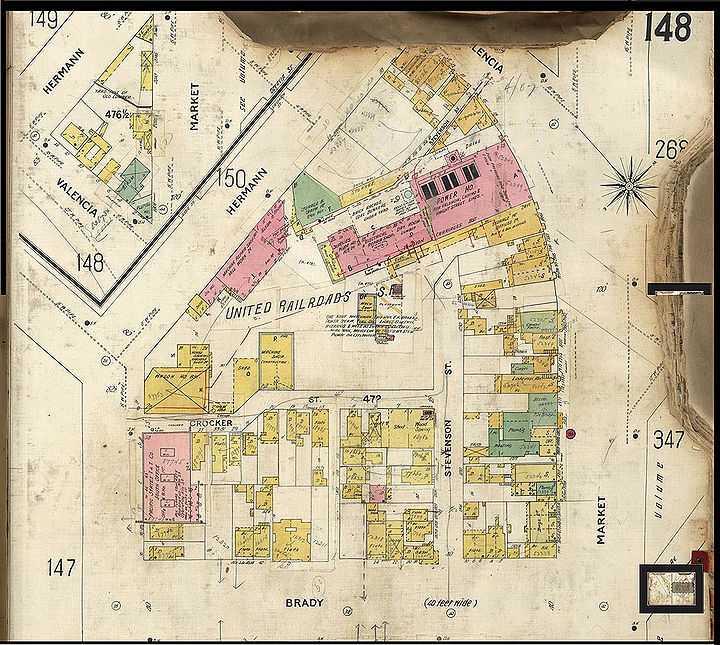 Sanborn insurance map, 1905, showing intersection of Valencia and Market and surroundings, with United Railroads powerhouse and carbarn in center. The name “Hub” eventually came to stand for the surrounding neighborhood as well as the intersection and was well-known to residents of the City. By the 1930s the neighborhood was alive with thriving businesses and a surrounding residential population. Many well-known businesses located here because of the ease of public transportation and the central location, including the Hub pharmacy (for many years San Francisco’s only 24-hour pharmacy), Hub Bowling and the McRoskey Mattress Company. McRoskey is the only business from the Hub area that survives to this day. McRoskey Mattress Company, 1920s, when Gough Street did not yet go through Market to Mission. 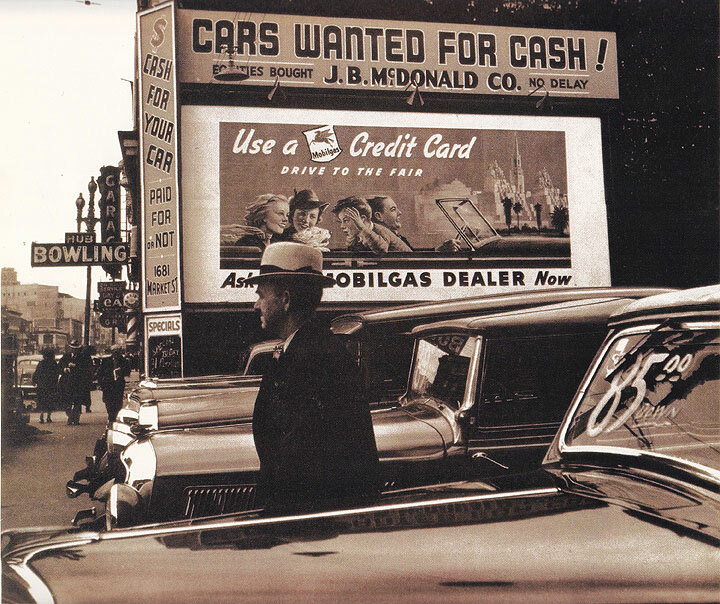 Used car lot on Market in 1939 where Gough now crosses through. 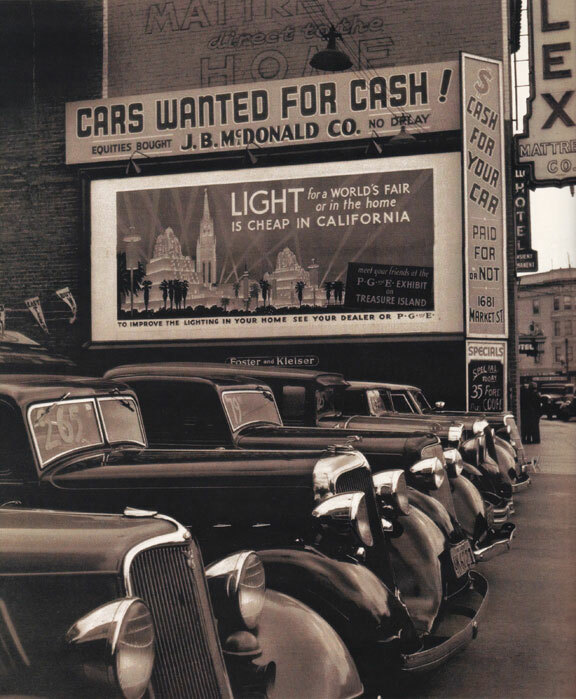 Used car lot on Market Street where Gough now runs to Mission Street,circa 1939. Note the sign in background: Hub Bowling, 1675 Market Street. Gough at Market, c. 1907, temporary structures still abound after quake. 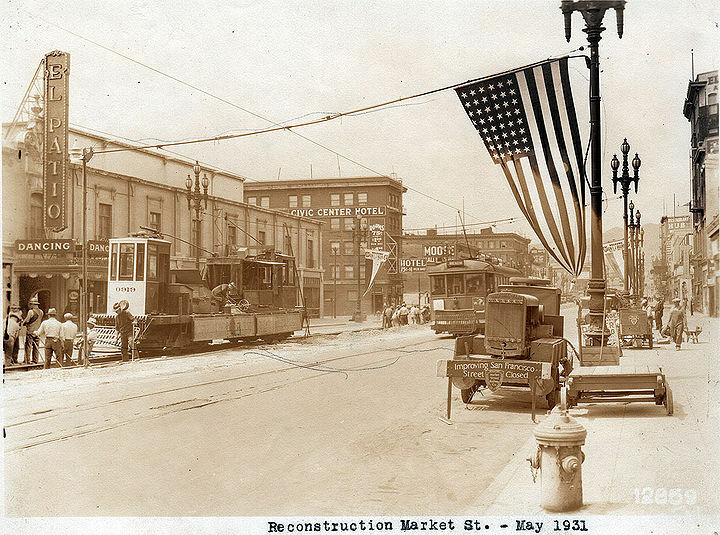 Market Street being rebuilt in May 1931. 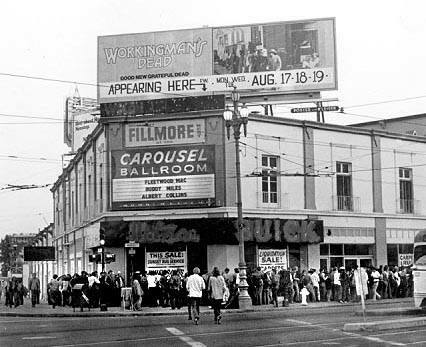 The famous Fillmore West at Van Ness and Market in 1970 when the Grateful Dead show was being advertised. 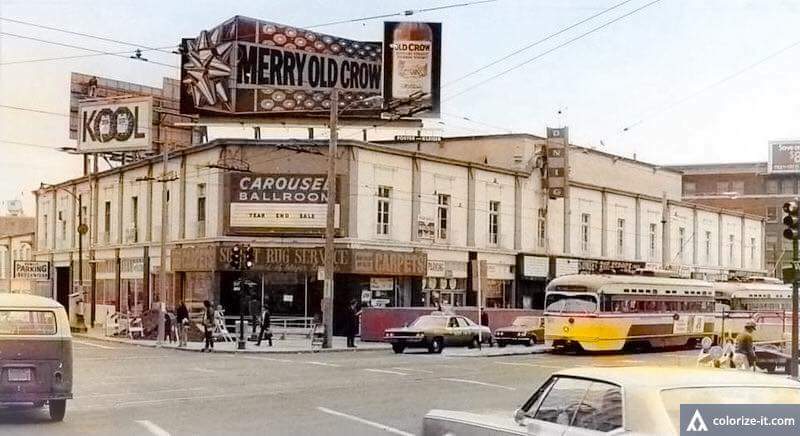 Carousel Ballroom before its renaming at Fillmore West. Aretha Franklin performing at the Carousel Ballroom, early 1960s. 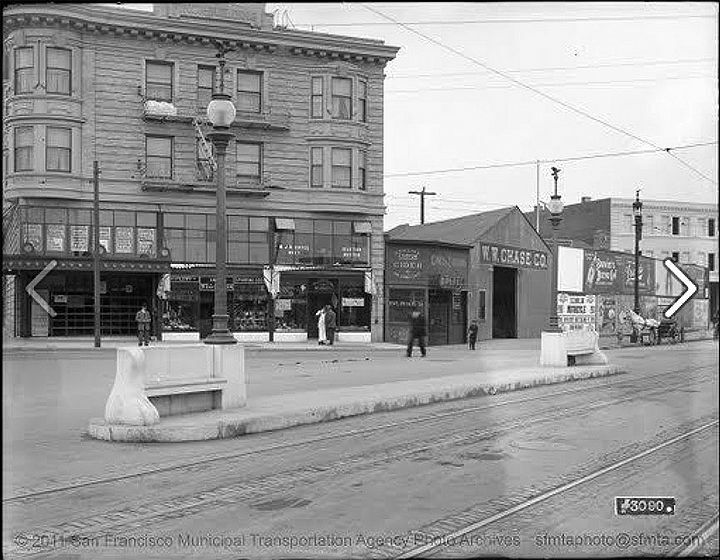 The name faded from public memory after the conversion of the Valencia and Haight street lines to bus service and the removal of two streetcar tracks from Market Street with the dissolution of the Market Street Railway, all in the 1940s. The neighborhood went into decline beginning in the late 1940s. Building the Gough Street extension, 1949. 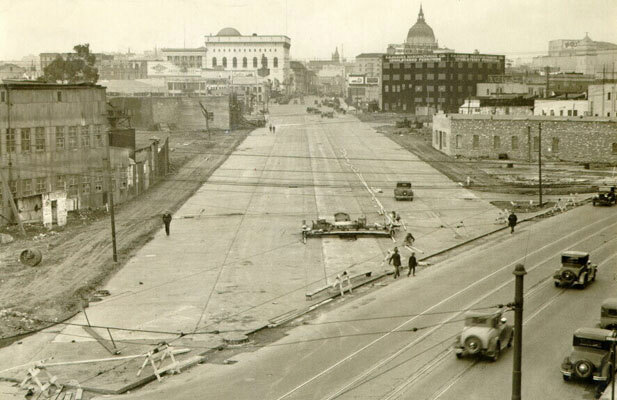 Construction linking Market Street with Mission, South Van Ness Extension, 1930s. 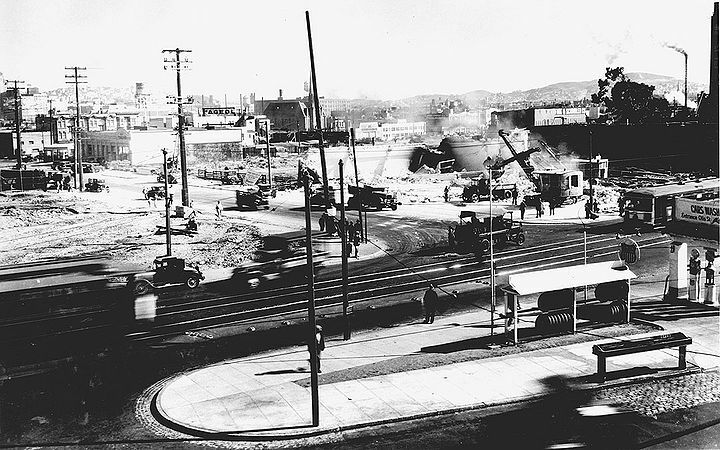 South Van Ness extension under construction, southerly view from Mission and Otis, Sept. 15, 1931. 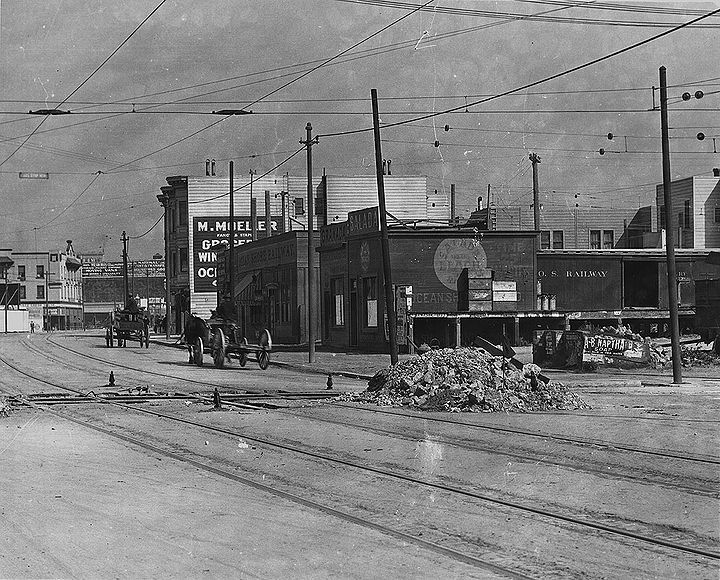 Mission and 12th Street, 1912. 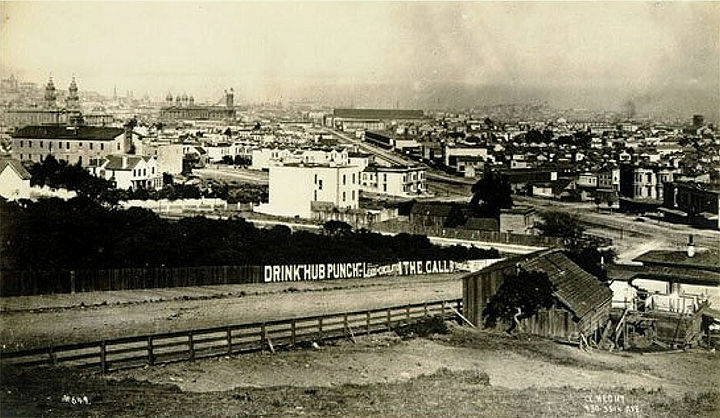 Today the reference to the “Hub” is largely forgotten except to history buffs, but a movement to revive the name in reference to a larger area with the intersection as its nexus has begun as the neighborhood becomes a part of the revival of the area in general and a reconfiguration of the intersection under the Market and Octavia Plan. 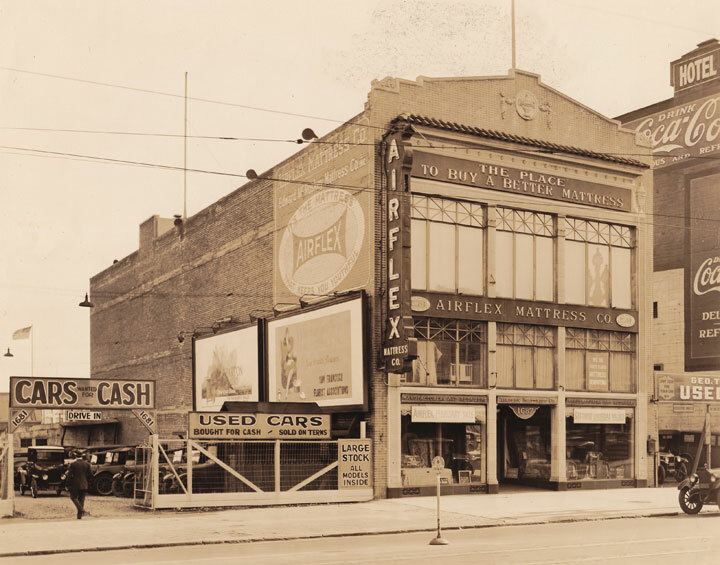 Several landmark structures populate the neighborhood today as it is poised for revival.